Neil is 49 years old and lives with his wife Mary in the North-East of England in the Tyne-Valley in a small rural town called Corbridge, near Hexham. He has a stepdaughter Sarah who lives close by. Neil is becoming increasingly known as the local 'Who-nut' since he has had some press while running a Doctor Who club at the school where he teaches. The only teacher we know that has a full sized Dalek and half size Tardis in his classroom! Neil's first 'Who' memory is of Lynx, watching the Time Warrior in a Lake District pub (age 4!). Perhaps this is why the Sontarans are still his favorite monster. He also recalls seeing (hazily) Alpha Centauri and the Ghost of Aggedor. Neil has extremely vivid memories of Tom's first season, especially Noah's transformation at the end of the Ark in Space part 3. Around this time Neils parents took him twice to the Blackpool exhibition where again he has a lasting memory of being bloody terrified by someone dressed up as a Zygon and Dalek Helium balloons. During the 1990's being skint and going through university Neil's collection was extremely modest although he never threw what little he had out. The biggest coup personally for Neil was collecting the Sevan kits and getting a nice letter from Stuart Evans with an offer to purchase a fiber-glass cyber-helmet which had come direct from the moulds used in 'Attack'. Quite a rare item at the time. Neil use to produce a fanzine, which got a lovely review in DWB, and another fanzine cover he drew appeared in DWM. Having started teaching in 1998 Neil was just about able to begin collecting seriously in a modest teacher kind of way. He had religiously collected the videos (which kept him going through the lean years) but realized he had grown weary of the merchandise scene, endless repeats of subtle color variants just wasn't where he was any longer. Neil's last attempt at collecting commercially produced items was the Harlequin range simply because they finally went beyond producing Daleks, Cybermen and the fourth Doctor. 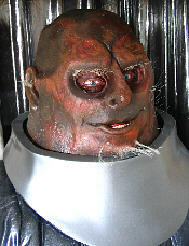 With a desire to own more full size stuff he started building his accurate Dalek and sculpting a Davros bust. Neil has always dreamt of having his own tiny version of the 'Blackpool Exhibition' that had so entranced him as a child. Attending a Bonhams auction not expecting to be able to afford anything but the catalog. He simply couldn't believe it when he left with a helmet from Revelation. 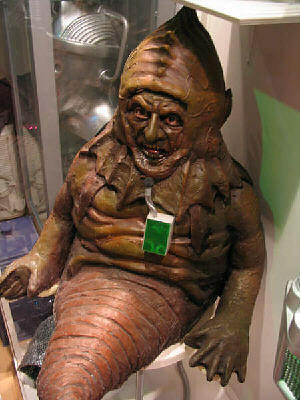 Neil has been collecting TV stage used props and costumes and good quality replicas ever since. He frames all his collection items himself and has been trying to get a good coherent display area together for some time. 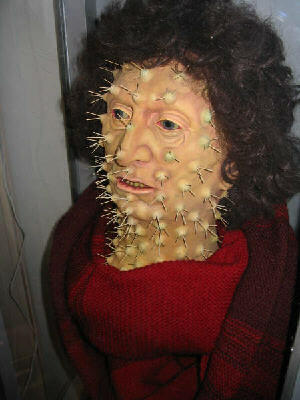 Mary is very understanding and thankfully enjoys Doctor Who herself and gave the green light to make a mini-exhibition area from the recently available spare room now that Sarah has moved out on her own. Some highlights of Neil's collection. 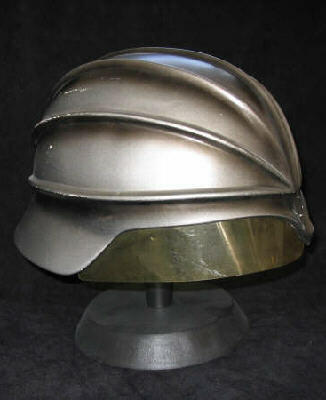 Tranquil Repose Guards helmet: Neil's first original prop! 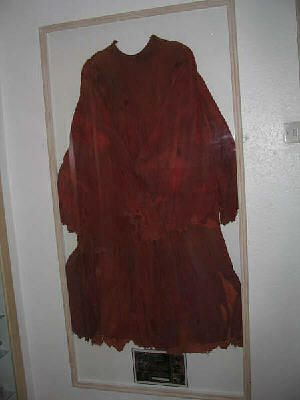 Ohica's Gown: Neil never thought he would own a costume from such a classic as Morbius. He bought it as a 'Sisterhood Gown'. 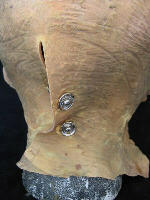 To his absolute delight when he looked inside the garment the collar was inscribed with 'Gill Brown'. It came complete with Bonhams auction tag. Neil would love any other parts of a sisterhood costume if anyone has any multiples (like the tabard or hat). 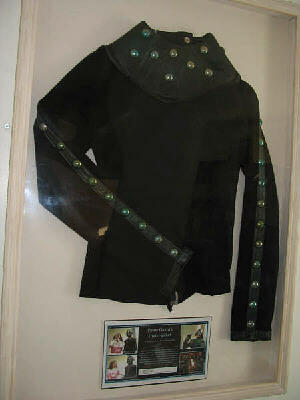 Pirate Planet Guard under-jacket: The basic tunic for the black guards, sadly without the waistcoat top part. Neil is thrilled to own an item from Tom's tenure, The doctor when he was a kid. 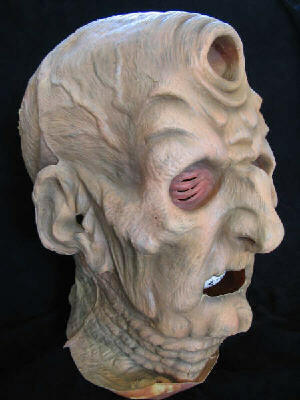 Terry Molloy's rehearsal mask from The Trial of Davros. Neil won it in the auction after the play. Terry was the auctioneer for this item and the Davros chair. The bidding was quite fierce but Neil bought it on the condition Terry would sign it for him (which he did after the auction, meeting me backstage to give it to me personally). The mask was one of about three & was used by Terry as the wear on the back around the pres-studs attests. 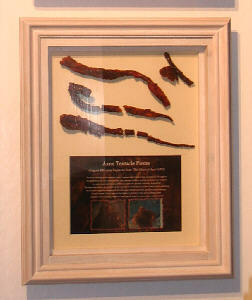 Axon tentacle pieces: obtained from Mick Mall, although Neil's stepdaughter refers to them as 'expensive turds' Neil sealed the fragile pieces in resin and matt lacquer. Twin Dillema: Twins Room set Design: A very worn document with allsorts of on set jottings. 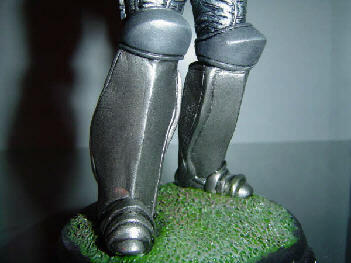 Field-Major Styre: a small and accurate model of his favorite villain. Neil sculpted it in clay and resin (around 7"). 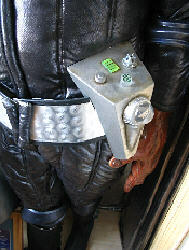 A replica costume based strongly on the original ‘Lynx’ version. The costume had appeared in a fan video production: if anyone knows anything about this Neil would love to hear from them. 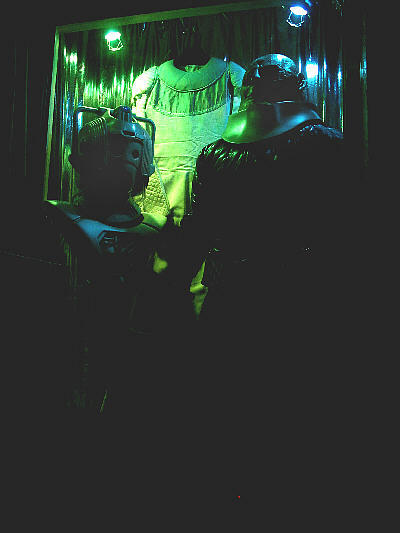 It is identical to the type of costume used in ‘The Trial of Davros’ filmed Sontaran evidence section: could it have been one of them? 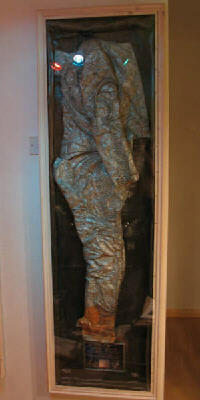 Neil put the costume on a padded mannequin, filling the hands and head with foam and then coating both in resin to minimise perishing. 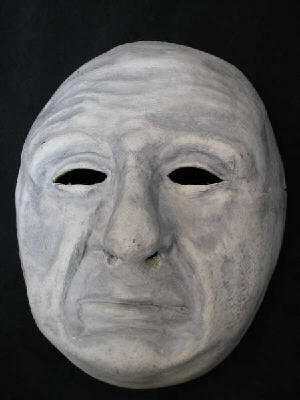 He then sculpted eyes, sockets, mouth, tongue and teeth to fill in the mask’s voids. Finally the now solid head was given a complete re-paint. 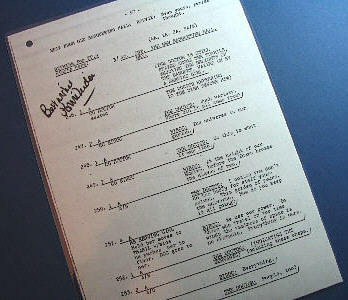 A single original script page from ‘Warriors Gate’ signed (for no readily apparent reason) by Jennie Linden. 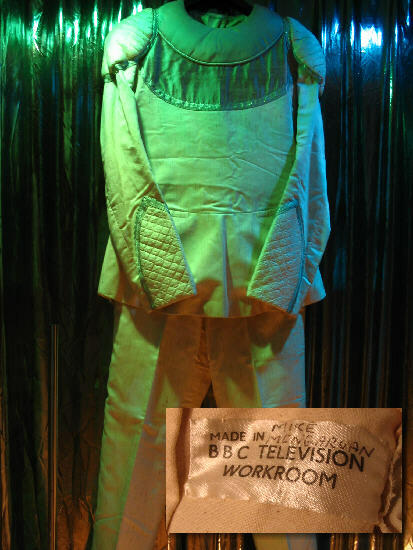 The Hyperion III’s Duty Officer uniform from ‘Trial of a Timelord’ eps 9-12 (‘Terror of the Vervoids’), played by Who regular Mike Mungarvan. Mungarvan can be seen throughout the story but gets his only on screen Doctor Who credit in episode 10 as the Duty Officer. 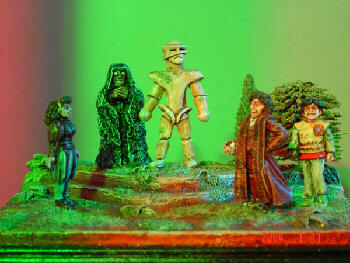 Mungarvan’s association to Who date back many years including playing a ‘Mutt’ in Jon Pertwee’s ‘The Mutants’. The costume comes complete with Bonhams auction tag. 40 pages of storyboard prints given to a production team member of the new series (Season 1). 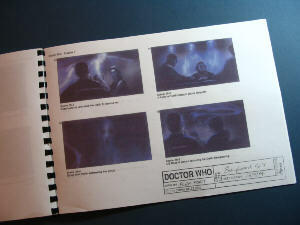 The storyboards outline effects shots only and were to act as a guide to CGI work. Scenes include several Platform 1 shots and Gelth sequences. 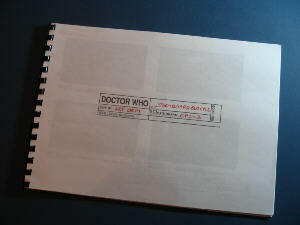 A 3-D card set model from �Trial of a Timelord� eps 5-8 (�Mindwarp�). 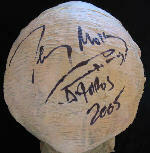 It came from the April 2005 auction at Bonhams, previously belonging to Colin Baker. 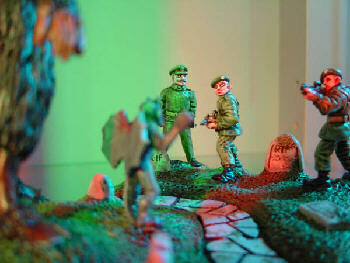 A similar set model can be seen in �The Complete Seventh Doctor� DWM special constructed for �Time & the Rani�. The model shows the corridor (a half grating/pipe construction), clearly shown in ep 6 where Peri goes to serve the Doctor, Kiv and Sil. The hexagonal structure is the large screen that Kiv and Sil sit in front of periodically. Inside is a scale doorway representing the entrance to Crozier�s lab. This comes from ‘The Green Death’ DVD special feature ‘Global Conspiracy’. Acquired direct from Steve Broster who made it. Steve has been responsible for producing many of the extra features on the classic series DVDs. The folder is possibly going to make one further appearance on another DVD shortly. 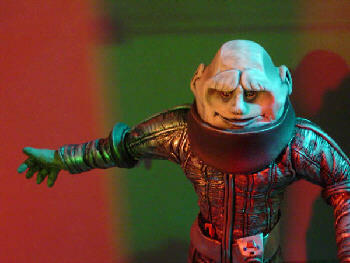 From ‘The Sontaran Experiment’. 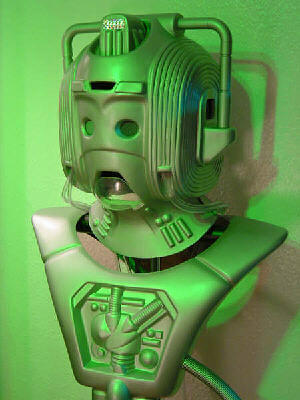 Acquired from an American collector who had been given it by a BBC effects tech who had relocated from Britain. The effects man found the rifle with its ‘BBC Workshops Prototype’ sticker on it. 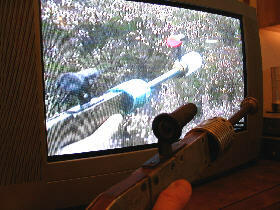 Neil identified the gun matching it precisely to the episodes albeit with the front piece (holding the bulb and doubtless fragile), missing. 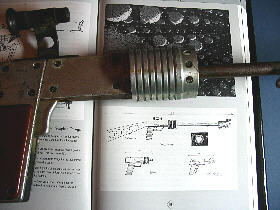 Records state that two GalSec rifles were made, with only one wired for ‘firing’ on location. 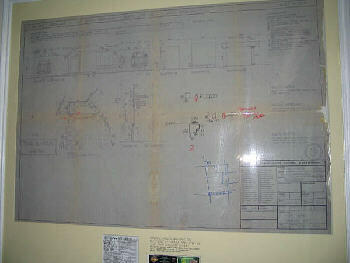 This version is fully wired and Neil suspects that this is the screen used version and not a prototype: on location the guns get thrown about and the wear and tear on the prop suggest use. 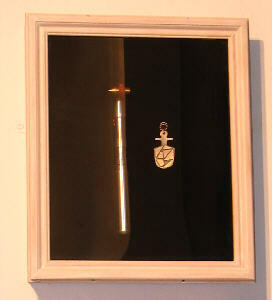 Neil thinks the sticker was likely stuck on post 1974, years later when the gun was placed in storage. You can still see the remains of the unusual chromed blue paint on the large barrel stub. Drone mask used in Happiness Patrol. "Joseph Lloyd - Collatin Judge"
Accurate 18 foot hand knitted scarf. Field-Major Styre model sculpted by Neil in clay and resin. 7 inches high. All of the pictures on this page are the property of Neil in Northumberland and may not be used or reproduced in any way without his explicit written consent.